St Peter, Liverpool Grove, Walworth, London SE17. If the main doors are locked, enter through the small door to the left of the main doors. If the inner doors are locked, please press the illuminated button to the right hand side. The entrance to the ringing room is up the staircase to the right hand side. St Peter’s was built in 1825 to the designs of John Soane, as one of a series of “Waterloo” churches to serve the expanding population of London. A ring of eight bells was also cast by Thomas Mears of Whitechapel in 1825, the heaviest of these weighing ¾ ton. The total weight of these bells was over 3 tons. Although they were rung regularly up till about 1914, they fell into disuse and became unsafe by the middle of this century. Several attempts were made to restore them, but St Peter’s tower is quite small and the bells had to be hung on two levels, to fit the available space. The solution was to provide a smaller ring of bells. In 1996 the parish was approached by St Anne’s Limehouse who were interested in installing a large ring of bells in their massive tower, and who had acquired a lighter ring of six bells from the redundant church of St Paul Homerton, the “Grocers Bells”. It was agreed to exchange St Peter’s heavy eight bells for the lighter six, in return for a contribution from St Anne’s towards the cost of installing them. St Peter’s. Fund-raising began, but unfortunately the parish was unsuccessful in securing a 50% grant from the £3 million ‘Ringing in the Milennium’ scheme. Never the less the parish continued fund-raising, and although the original target was not reached, sufficient was raised to purchase a light ring of eight bells from St Andrew, Short Street SE1 and to hang these instead. St Andrew & Thomas Short Street was completed in 1958 and was built to replace the two separate churches of its dedication. Both churches were badly damaged during the 1939-45 war and it was decided to demolish what was left of the two buildings and merge the two parishes on 27th November 1956. The new church was situated on the site of a former mission chapel in Short Street. The church was consecrated on 1st November 1958. Although the towerwas designed to accommodate a ring of bells, there was no money available to fulfil the project. The incumbent, the Rev. J.E.F. Tredennick was a bellringer and he was keen to have his own ring of bells. The 1960’s was a period of rapid depopulation of the inner city areas. This led to many church closures and pastoral reorganisations. A neighbouring church, Holy Trinity Newington, fell victim to this trend. 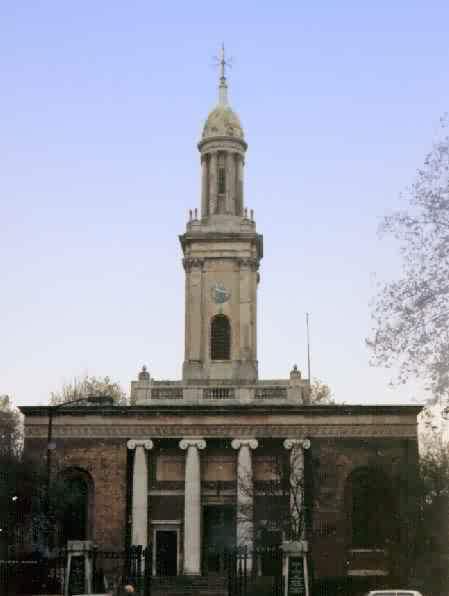 The church was one of the 1818 commissioners churches and had been designed by Francis Bedford, who also designed St George’s Camberwell and St John’s Waterloo Road. The small tower here (10ft-0in square) contained a heavy derelict ring of eight bells. The bells had been cast by Thomas Mears II at Whitechapel in 1824 and they hung in a wooden two tier frame (four on four) built by Mr Charles Oliver. The Diocese offered the bells to St Andrew’s who accepted the gift. The bells were far too large for a brick tower so they were recast into one of the early ‘miniature’ rings that have become increasingly common. The excess metal not consumed by the new ring was used to defray the costs of the whole project. The new bells were cast in 1971 at the Whitechapel Bell Foundry; the bells were hung in a steel grillage. This had the disadvantage of transmitting all of the sounds of metal striking metal into the brick walls and on throughout the whole building. This is what is termed ‘clapper knock’ and outside, with the sound control closed, it sounded almost as loud as the bells themselves. The restoration of St. Peter’s bells is part of a wider plan to revive and teach the art of bellringing in South and East London. The intention is that, once restored, ringers will be taught and the bells will be rung regularly for services. In the last ten years the rings of bells at St. James’, Bermondsey, St Mary’s Rotherhithe, Christchurch, Isle of Dogs and St John’s Waterloo have been restored, and a new ring of bells has been installed at St Anne’s Limehouse. This work has cost in excess of £225,000 and donations have come from a wide range of sources. In addition much voluntary work has been put in to help keep costs down. These churches now have an active group of bellringers and are closely involved in promoting this project. If you would like to see what has already done, you would be more than welcome to come and have a look. St. Peter’s, Walworth is in Faraday Ward in the Borough of Southwark. According to the 1996 Poverty Profile, Faraday is now rated as the third most deprived ward in the Borough, dominated by the Aylesbury Estate. Eighty percent of its population lives above 2nd floor level and crime rates are relatively high. Unemployment, low earning households and the proportion of children in unsuitable accommodation are all the second highest in the borough. The ward has a population with a young age profile, and a high proportion of 17 year olds who are not in full time education. The church sees itself as having a strong role in enabling and encouraging local people. The building, which is listed Grade 1, is used for meetings, keep fit, an old people’s club, and other youth and community activities as well as having a large Sunday congregation. We see this project as offering another way for local people to learn new skills, as well as improving the local area and raising the profile of Walworth. This project is the first stage in a programme of complete renovation and regeneration of the church and crypt to provide first class community facilities for the people of Walworth.